Satellite used to illustrate the story. 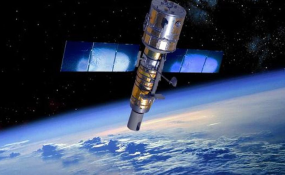 Rwanda has launched a satellite named Icyerekezo, which will bring internet connectivity to students at Nkombo Island, in Lake Kivu. Rwanda wants to bridge internet connection in rural areas around the country. A satellite named Icyerekezo by students from Nkombo Island in rural Rwanda at Lake Kivu was launched on the 26th of February, 2019. The satellites were launched in French Guiana by UK company OneWeb in partnership with the Rwandan government. The satellites were launched to "bridge the digital divide" in rural schools in Rwanda where internet access is non-existent. OneWeb, a global communication firm which seeks to "deliver connectivity for everyone, everywhere, through a global satellite constellation," through its founder Greg Wyler said "Connecting remote schools to bridge the digital divide that still impacts half the population of the world is at the heart of OneWeb's vision. We are delighted to partner with the Rwandan Government and particularly the students of Nkombo. The connectivity we can provide them will allow them to realise their dreams and allow Rwanda to become a hub for technological innovation." The satellites were not launched in Rwanda because satellites are normally launched by the sea to minimise risks, and this launch was a partnership. The Rwandan government has always sought the use of technology to solve challenges the country faces. Rwanda was the first country in the world to use drones to transport blood to remote clinics. The launch of Icyerekezo has far more reaching impacts than just internet access. Rwanda's Minister of Education Dr. Eugene Mutimura said, "Connecting schools is a foundational aspect and driver of transformative learning. Rwanda's ICT in education Master Plan outlines ambitions of interventions to connect schools and empower Rwandan children with immense opportunity, notably research, support our competence based learning, ease to access and share digital content, support systems to monitor and evaluate process among others." The use of standard fiber optics would have been a more expensive and inefficient choice for Rwanda. Paul Ingabire, Rwanda's Minister of ICT and Innovation said, "Rwanda's choice to invest in space technologies is part of our broader mission to bridge the digital divide by providing equal digital opportunities to rural and remote communities. The students at "Nkombo" named the satellite "Icyerekezo", this truly depicts their own aspirations to embrace STEM fields and emerge the workforce of the future. This partnership responds to our intention of becoming a regional Technology Innovation Hub, opening new pathways for connectivity, providing better education and creating new opportunities for our innovators." OneWeb is partnering with other African countries like Sierra Leone to make schools have more access to the internet.